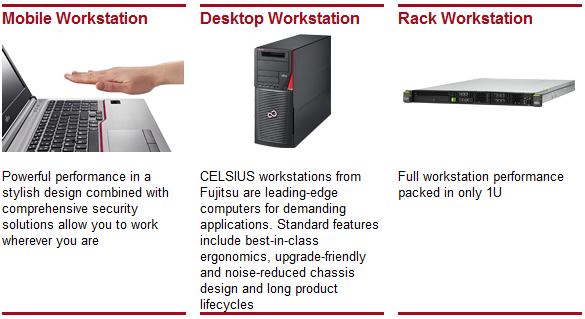 As Fujitsu’s Coprporate Partner, Infinite Solutions can offer you Desktop Computers and powerful Workstations from the overall Fujitsu’s products line. Fujitsu recognizes that one size does not fit all for corporate customers. The ESPRIMO and CELSIUS lines offer a variety of products that can meet any computing need. You’ll find Fujitsu offers exactly what you need at the quality you expect. The Fujitsu ESPRIMO family is a complete range of highly expandable PCs that run your office applications dependably. Outstanding production quality ensures reliability, and systems with patented 0-Watt technology reduce energy costs by up to 40%. Individual configurations and the unique DeskView pre-installation solution ensure you can minimize rollout and management costs for years to come.